WEARCO supply an extensive range of Chisel Tools for hydraulic breakers. We supply tools manufactured by ROCK, Indeco, Montabert, Rammer, Krupp Atlas Copco, NPK, Cat, Drago, Soonsan, Furukawa, Kent, Rotar, Arden, Yanmar and others. The right choice of chisel tool is very important for the efficiency and durability of the breaker and tool. Suitable for breaking concrete and all earth works in soft, non-stratified rock. Suitable for breaking concrete or medium-hard, non-stratified rock. Suitable for breaking rocks of any hardness or to reduce size of rubble. Suitable for breaking hard reinforced concrete as well as sedimentation material. Suitable for breaking concrete as well as excavation of soft to medium-hard, stratified rock. Suitable for working in frozen ground, concrete, bitumen or schist as well as excavation. suitable for pilework or press-moulded supports for guardrails, etc. Whether you are an independent contractor or a big construction company, we can cover your needs in heavy demolition bits for hydraulic hammers. We have access to any tool bit for your ground engaging demolition tools: moil points, chisels, blunt tools, asphalt cutters, ramming tools, tamping plates etc. We can supply demolition bits for ALLIED, ALLIED STREET HAMMER, ATLAS COPCO, BOBCAT, BTI (TELEDYNE), CATERPILLAR, CHICAGO PNEUMATIC, D&A, GEHL, HUSKIE, INDECO, JCB, KENT, KOMATSU, KUBOTA, LIFTON, NPK, OKADA, RAMMER, ROCKBLASTER, SCHAEFF, SOCOMEC, SOOSAN, STANLEY, TOKU, TAKEUCHI and TRAMAC. Quite often, our customers find it difficult to identify the exact make and model of the hydraulic hammer they use and therefore require help to order replacement demolition bits. WEARCO can provide assistance by utilising our extensive database of tool bits for hydraulic rock breakers. The breaker must be sized properly for both the work it will do and the carrier on which it will be mounted. The type of work is the most critical factor in choosing the breaker size. Small Hydraulic Breakers (Hammers): up to 1200-ft.lbs. (1627 Joules) are typically used in concrete and other light duty work. Medium Hydraulic Breakers (Hammers): 1200 – 4000-ft.lbs. (1627 – 5423 Joules) are used in both concrete and rock applications with limitations on the size and amount of material to be broken. Large Hydraulic Breakers (Hammers): over 4000 ft. lbs. (5423 Joules) are typically used in rock and large scale concrete demolition projects. Breaking Oversize Material: When breaking oversize material, the breaker is expected to break the material down the middle into two pieces. This is optimum production. If the operator has to re-position the breaker towards the edge of the rock and gradually downsize the material, production rate slows down. To assess what size of breaker will effectively handle this application, the size and hardness of the material must be known. If a 4 cu. yard piece of hard rock (20,000 psi or greater) needs to be broken in half you will require a 7,500-ft. lb. or larger breaker. If a 2 cu. yard piece of limestone (20,000 psi or less) needs to be broken in half you will require a 3,000 – 5,000-ft. lb. breaker. Trenching: When trenching, the breaker is expected to fracture a solid mass of rock into manageable pieces. The size of the material could be 100’s of cu. yards and the energy will be quickly absorbed. This is why it is recommended to work from a bench so the rock has somewhere to break out. We recommend when trenching in limestone or medium hard rock, to use a 3,000 – 5,000-ft. lb. breaker. When working in hard material we recommend a 7,500 – 10,000-ft.lb. breaker and, if high production is critical, a 13,500-ft. lb. breaker would be beneficial. Breaking Concrete: When breaking concrete, the breaker is expected to penetrate the material allowing it to crack and shake loose from the reinforcing steel. High frequency breakers tend to provide better performance in this application as it is not the energy per blow but the fast blow rate that destroys the concrete’s structural integrity. We recommend to use a 750-1,500-ft. lb. breaker on concrete walls, footings and floors. With larger projects, consisting of large footings greater then 4 cu. yards, use a 2,000 – 5,000-ft. lb. breaker. The high production demand of bridge and building demolition requires a 7,500 – 10,000-ft. lb. breaker. After considering the application work, the carrier on which the breaker will be installed needs to be considered. Hammer manufacturers have assigned a ‘Recommended Carrier Weight’ range to each breaker. If the operating weight of the carrier falls within this range, the carrier will safely handle the model of breaker. If the desired breaker falls outside of the recommended carrier weight range, the carriers lifting capacity and oil flow will need to be verified to ensure a proper fit. Lifting Capacity: Provided the weight of the breaker does not exceed the maximum lifting capacity at any position, the carrier is assumed to be stable. 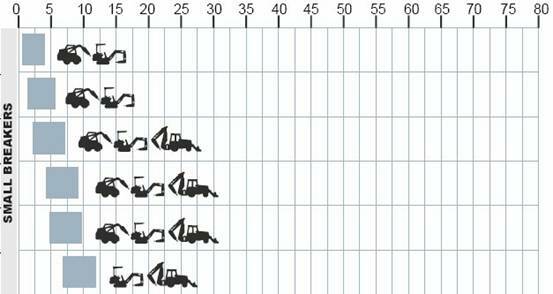 On most loader backhoes and excavators, the maximum lifting capacity is lowest when the boom is at full reach. This is the value that must be compared to the operating weight of the breaker. Oil Flow and Operating Pressure: A required oil flow range is specified for each breaker. Oil flow to the breaker within this range is adequate for operation. However, for maximum productivity the carrier should be capable of providing the maximum required flow. Compare the maximum oil flow requirement of the breaker with the oil flow capacity of the carrier. Remember the breaker operates at 1500-2500 psi. therefore oil flow should be evaluated at operating pressure. Please refer to the following charts ‘Sizing the Breaker’ which outlines the recommended carrier weight range. Find your carrier weight along the top of this chart. Draw a line straight down from that weight. Any shaded breaker bars intersected gives you a breaker suitable for your carrier.